Print Configurations let you specify which pages should be printed/saved for different audiences. For instance, you might have a multi-page form where some pages can be shared with customers, a different set of pages which must be sent to an inspection agency, and the rest are for internal use only. 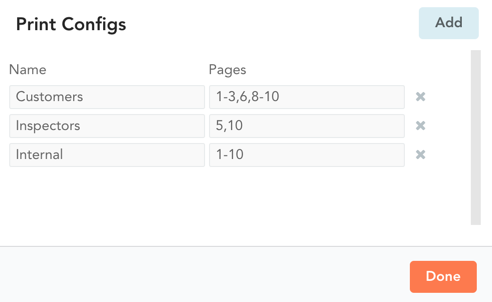 With print configurations, you can set three standard options defining which pages can be shared to each of these groups. Whenever you print the form, save it as a PDF, or configure an email workflow, you will see these standard print configuration options and can select the appropriate one for your audience. Print configurations are set separately for each template using the Print Config window. To edit your template’s print configs, open the template in the Template Editor, expand the gear menu and select Print Configs. To add a new configuration: Click the Add button at the top, then edit the new config that appears. To edit an existing configuration: Click on its Name and enter the desired config name; this is the name by which it will appear throughout the app. Then click on its Pages column and type in comma-separated page numbers and ranges. For instance "1-3,6,8-10" means pages 1 through 3, page 6, and pages 8 through 10. To delete a configuration: Click the X button to the right of the config that you want to delete. When you are done, save your template by clicking Save Changes at the top of the Template Editor. Don’t forget this step — your print config changes will not be saved until you do this!